If your students save their work in PDF format, you may need to markup or annotate those PDF documents before returning them. PDF is often the format used for forms, so if your department requires you or your students to fill out forms on a regular basis (to obtain permissions or other information), convert the form to PDF and allow your students to complete them digitally. There are various iPad apps available for dealing with PDF documents. Choose the one that suits your objective best. Filling out forms. If your primary need is to fill out forms and sign them, consult the PDF Expert iPad app. PDF Expert reads most document types and provides standard highlight and annotating functions. Use the keyboard or write on the form with your finger or a stylus. 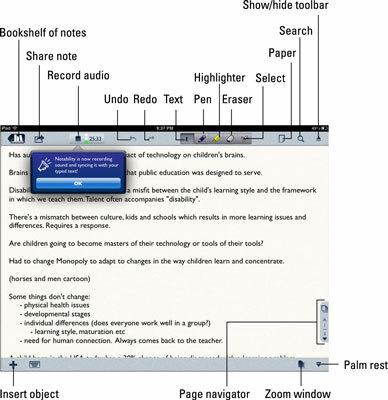 Annotations are saved within the document in PDF format. 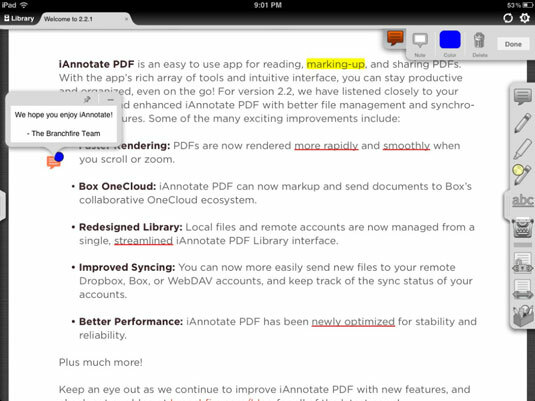 Like most PDF annotation apps, PDF Expert links to your cloud accounts so that you can download documents easily. The app excels in its support of PDF form fields and functionality created in Adobe Acrobat. Special fields such as text fields, check boxes, radio buttons, and other form elements all function as needed, and all information you enter is saved inside the form including, of course, any signatures. Writing serious, heavy-duty annotations. If you’re looking for a robust annotation app that can be used for everything from grading papers to marking up important business documents, take a look at iAnnotate. iAnnotate provides a wide range of annotation features, including annotation tools such as a pen, highlighter, typewriter, stamps, notes, underline, strikethrough, photo, date stamp, and even voice recording. Create your own custom stamps, including even your signature. Organize, insert, and delete pages. Organize files with the graphical file manager. Use the navigation and search tools to find any text you need anywhere in your library. Going the simple yet effective route PDFpen lacks the organization and management features of apps like iAnnotate, but it provides all the features you’d need for annotation within a simple and effective interface. You can add text boxes, notes, comments, highlights, and strikethrough, for instance, and many other features make it simple to mark up any document you retrieve from the cloud.